On Saturday Alyce had her first trip to the movies. 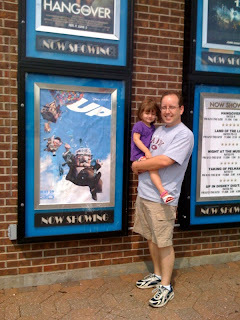 We took her to go see the new Pixar movie "UP". This wasn't Alyce's first movie just the first trip to the theater. Alyce is a big fan of Pixar movies with her favorite movie being "Cars". We ended up watching the movie at the theater in my hometown. We did this because my mom, grandma, was willing to babysit Luke. We got to the theater a bit latter than we wanted and thus it was already dark by the time we got there. Alyce didn't have any trouble with the darkness and held my hand until we could find our seats. This theater was nice in that they provide booster seats for the kids. There wasn't anyone in front of us but Alyce did enjoy being up higher. Another point about this movie was that it was in 3-D requiring us to wear special glasses. At first Alyce didn't want to wear the glasses and she didn't even want me to wear the glasses but about halfway through the movie she started wearing them and kept them on the rest picture. Alyce did pretty good during the movie. I would give the entire experience a B. The movie was rated PG for Action and Peril and they were right. There were a few scenes that were perilous and Alyce has some issues with them. The first scene she had a problem with was when the heroes were flying into a thunderstorm. The second scene was when one of the heroes friend's a big bird was being taken away by the bad guys. When that was happening she called out "Birdie... No..."! This one was especially rough on Mom and I as this was the first time she had ever reacted in such a way. When it was all said and done Alyce seemed to enjoy the movie but not like the way she enjoys her other Pixar movies. I think this movie might have been too advanced for her, but that is chance you take going to the movies and not previewing it ahead of time. In the future we might have to take more care in the movie choices we make, but it is good to know she can handle sitting for two hours in a dark room. Next time we will introduce her to popcorn! 0 comments on "Alyce's First Movie"